Learn about sea life around the world with these Sea Life Notebook Pages. Use the spaces provided for recording taxonomy as well as your observations. 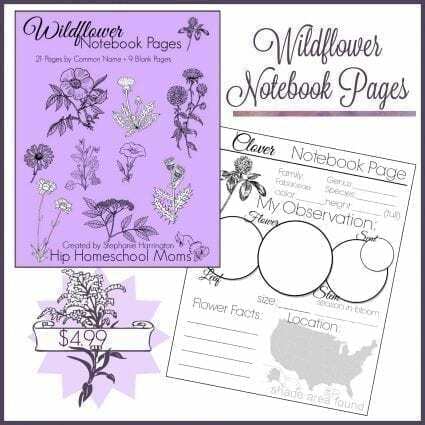 The black and white format and minimal color makes printing affordable and allows for adding color and personalization as your child fills in each page. 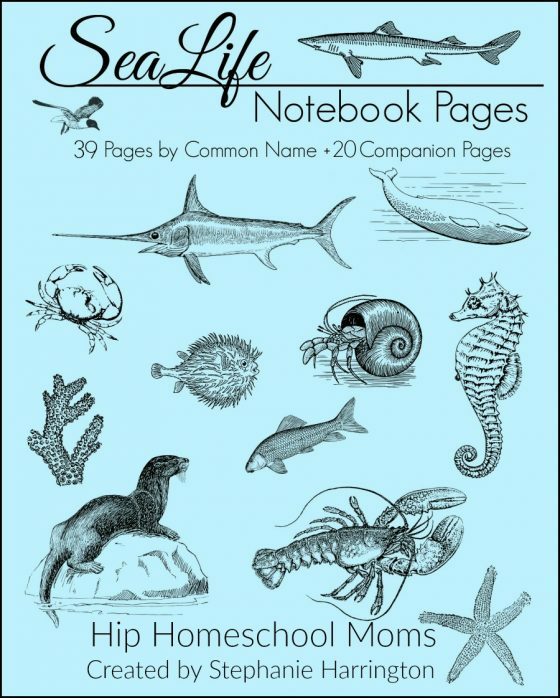 Choose from 39 sea life pages by common name. Select the right page based on the most specific classification in common. If the animal page you’re looking for can’t be found, use the blank page or one of 19 more lined companion pages provided. 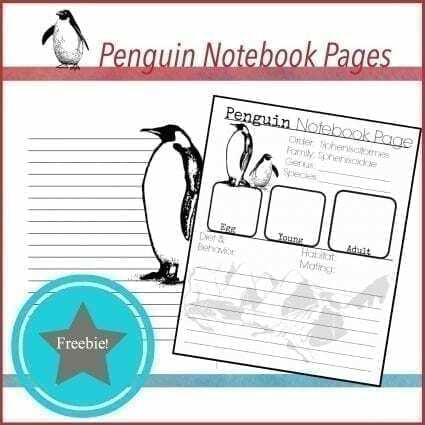 This PDF includes 59 total notebooking pages and is a PDF digital download product. Packed full with 38 sea life animals and 1 plant (kelp) by common name, these Sea Life Notebook Pages include space for drawing a sketch of the species you are studying and its life cycle. 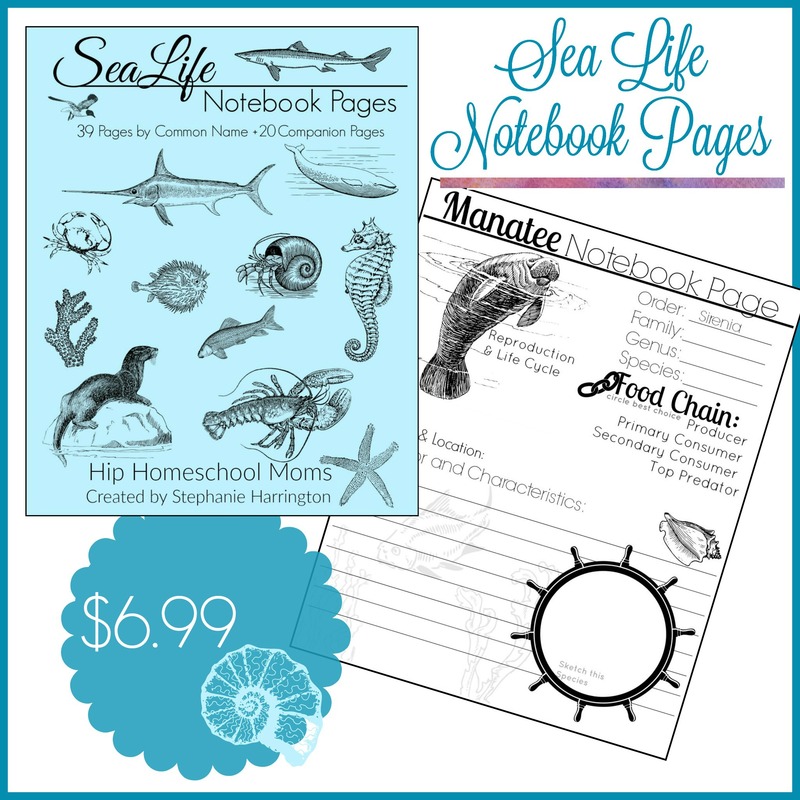 You can use these sea life notebook pages year after year for several ages and levels. 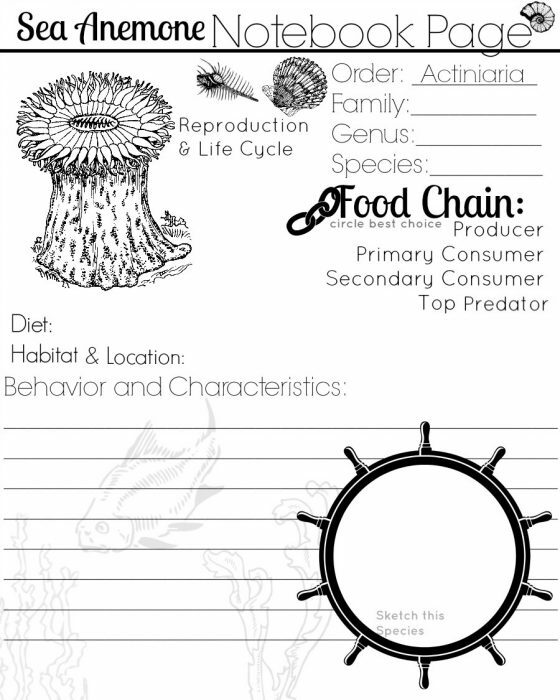 Use them for elementary unit studies, specific reports and research projects for middle school students or even as a supplement for a high school marine biology course. 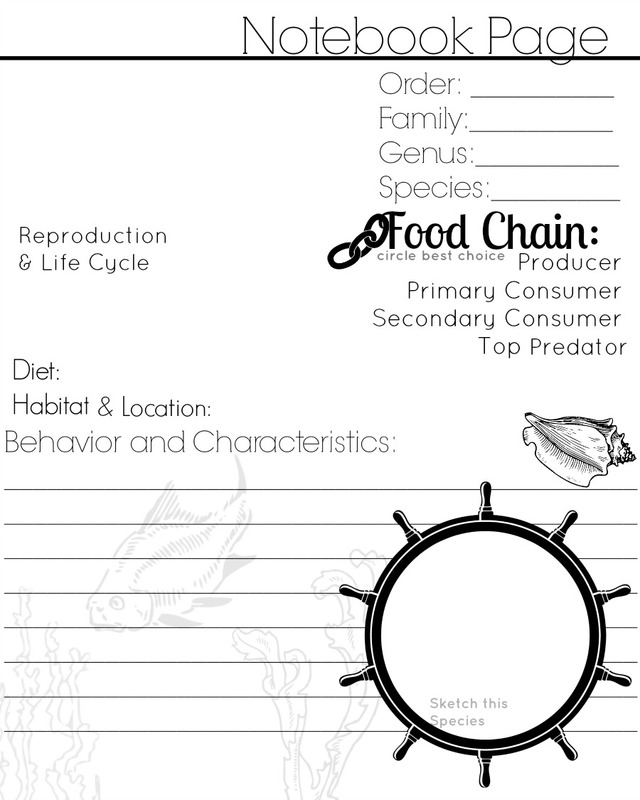 Unlike many science notebooking pages, these pages offer space specifically designated for recording taxonomy as well as where it lies on the food chain. In addition, there is plenty of space for recording it’s behavior, diet, location found, and extra lined space for making notes of its other characteristics or additional facts. In addition to using these pages with many ages, you can use these sea life notebooking pages in a variety of ways. For example, using them as a supplement to an in depth study on sea life is very comprehensive. I highly recommend using them to compliment Apologia’s Swimming Creatures of the Fifth Day. Or in contrast, you can also choose to use them as a stand alone tool and fill them in with the facts you get from your research. This method works best for a smaller unit of study or an exploratory or delight directed approach. 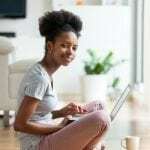 Regardless of whether you choose to use them in the field or in your classroom, they are designed to aid your children in recording their research. Older children may enjoying sketching the specific species in the ship’s wheel on the page while younger children could cut and paste pictures from magazines and printouts to glue on their pages. First, identify the species you are observing or studying and write in its scientific classification in the space provided. At the very least find out it’s binomial nomenclature. You can use extra empty space on the page in many ways. 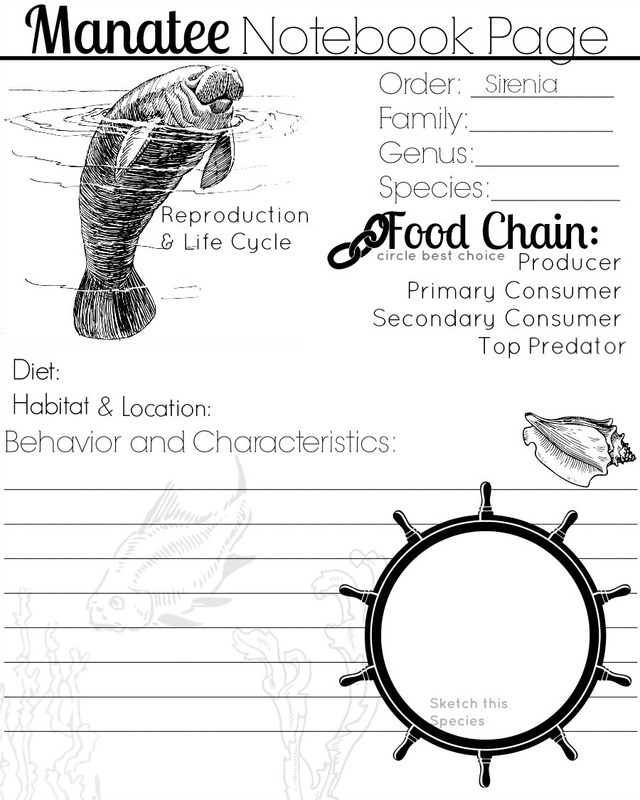 Sketch the animal’s life cycle or write a few notes on how they reproduce. If you feel it necessary on some pages to write the more specific common name – especially for the seals and bivalves pages there is a space available to do so. Your child should also circle if the species is a producer, consumer or predator. What if the sea animal I need isn’t included? ~The packet includes 20 supplemental pages too! The packet also includes 20 supplemental pages. There is one generic blank page that can be used for any sea creature, plant or animal. 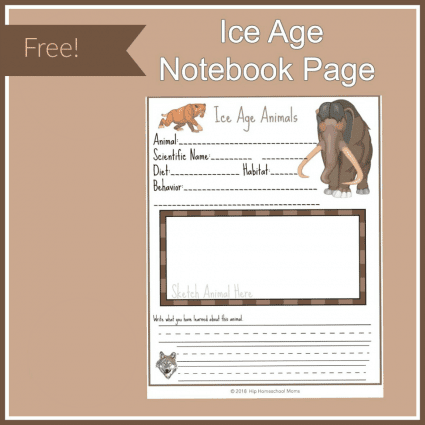 This page gives extra space for drawing and sketching the animal they are researching. The PDF also includes an additional 19 lined pages in a variety of formats for report and paragraph writing. Print out the pages you wish for the specific assignments you plan! Study one sea animal and go into depth. Explore sea animals with an oceanography unit. Examine swimming and underwater mobility with a unit on fish. Combine ocean study with a book such as Pagoo for a tide pool unit. Learn more about a particular sea animal with a literature or history study. For example, Murex and Sea Snails can be investigated with a Unit on the Phoenicians. I would use the conch or blank page for this. Using what you’ve learned about sea life, write a story on one or more of the blank lined pages. 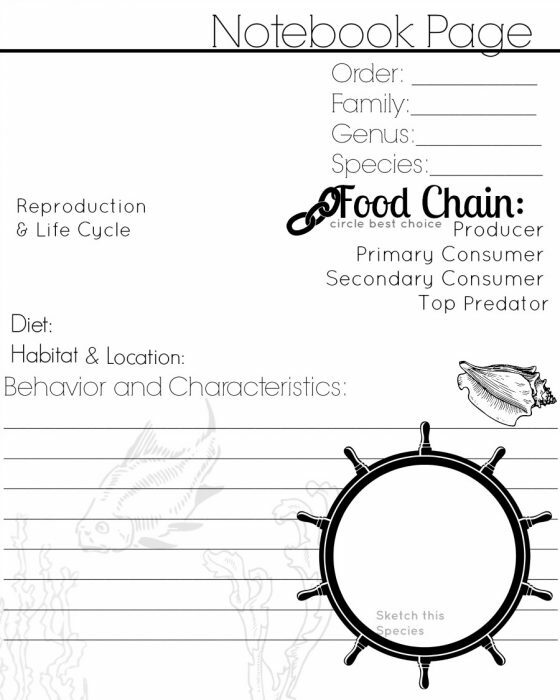 Go to the local aquarium for a day and create a notebooking journal of ocean life from the field trip event. Choose one common sea animal to study, say jellyfish, and use the jellyfish page multiple times to make a book of species. Use these pages for a report. Consider making a presentation board with them for an oral presentation. Take them into the field for writing down observations and taking notes if you live near the sea. Study a particular nation or continent for which a species is native. Do a fun sea unit based on a book, song or movie. For example, do an art project with the book The Rainbow Fish. Janice VanCleave’s Oceans for Every Kid: This book if full of ocean related experiments and easy hands on activities! See my FULL List of Sea Life Book Recommendations on the blog!